Firm thick padding at the waist band combined with soft light padding at the shoulder straps. This combination is rare in the carrier world, but is one that really works for some many people because it gives great support at the waist and weight transference onto the hips without feeling bulky on the shoulders. Ability to wear the straps either ruck sack style or crossed acrossed the parents back depending on personal preference. Easy to adjust seat. The seat of the carrier has two settings – narrow and wide that can be easily swapped between using a simple pair of poppers. 4 carrying poisitions. You can carry your baby on your front facing you, on your front facing outward, on your hip and on your back giving you plenty of flexibility to use this carrier in different ways. And the adjustable popper seat means its super easy to quickly switch back and forth between facing in and facing out positions. But where the Beco 8 differs from the Gemini is that it is bigger. The panel is about 1cm longer on the Beco 8, while the wide setting is about 2cm wider. The narrow setting is actually the same on both carriers. The bigger panel simply means this carrier will last longer. It will take longer for your baby to grow out of it. The taller panels often mean smaller babies don’t fit as well but as the Beco 8 comes with a small infant insert to raise the height of the baby within the carrier this isn’t the case for the Beco 8. This is a carrier that works really well from newborn (or at least a few weeks old) until around 2 years of age, quite possibly longer. In terms of weights, the Beco 8 is weight tested from 3.2 to 20 kg (7 to 40 lb). When you compare this to the Gemini these extra few cm give you about an added 6 months of longevity and 4 kg extra on the weight max. Lumbar Support – a little panel that sits comfortably over your lower spine and helps support your lumbar region and stabilises the waist band. This is fab while carrying a heavier baby on your front, and can be removed if you don’t like it or so that you don’t have a weird pad on the front. Zip down mesh panel – the standard carrier is made from a durable but fairly soft polyester, then in warmer weather the central panel can be unzipped to reveal breathable “3D mesh”. I am not entirely sure what 3D mesh means other than you can’t see through it! Like overlapping layers of mesh, so there is no possibility of little fingers getting stuck or of it getting snagged on anything. This is the same mesh as is on the Gemini Cool but the beauty of the 8 is you don’t need to choose between mesh or solid… you get both in one carrier. (Unless you don’t like the idea of polyester and mesh, and in which case they sell a all cotton version which lacks this zip down panel). Infant insert – which simply attaches via poppers so easy to remove if you don’t need it or don’t like it. I like that this insert pillow has a narrow and wide setting as this allows different baby’s to be accomodated in different ways as suits them as they grow. All of which is good stuff! But the downside is that with all these added bits this carrier takes up quite a lot of space when folded! Roughly about twice the size compared to the Gemini. It’s also correspondingly more expensive. This is a great carrier for those who want a long walk carrier and those who want all the features and bits and bobs. But it doesn’t have the simplicity and sheer magic the Gemini has in being quite a slimmed down non fuss, easy carrier. There are more bits and bobs to faff with and get used to. Some love this, some people really want those extra bits… while for others less is more. Really just depends on personal preference! All in all the Beco 8 is another great carrier from Beco. The 8 will particularly suit bigger babies, those who are higher up on the centile charts and will benefit from a bigger carrier that will last them longer before they grow out of it. It’s a great sunday hike, wear all day carrier as it doesn’t comprimise on comfort or features! It’s a flexible carrier offering multiple carrying positions and combines a firm supportive waistband with lighter softer shoulder padding. The Beco 8 costs £125 and is available to purchase from Sheen Slings at sling library meets, consults and workshops (or please get in touch for doorstep collection or even postage). The first time I ever saw a Connecta my first thought was “I bet that’s uncomfortable”. At that point I’d only ever tried fairly well padded carriers like Ergo’s and Manduca’s and the thought of carrying my then 9 month old something with a completely unpadded waist band and barely-there padding made me shudder. I was, of course, totally and utterly wrong. What I realise now is padding is not necessarily an indicator of comfort. Padding can be great if it fits you well, but if the shape is wrong for your body then that padding can actually make matters worse by ‘standing off’ your body in places and thus focusing the weight onto smaller pinpoint areas. What matters far more than padding level is how a carrier fits you. If it fits well it will be comfortable, if it doesn’t fit well then it won’t. Simple as that! The genius of the Connecta is by not having bulky padding it gives a lot of people an absolutely perfect fit – because the webbing waist band and the softly padded shoulder straps are able to mould exactly to your body and give a very even weight distribution. Connecta currently come in 3 sizes – standard (birth – 2 years ish), Toddler (18 months – 3 or 4 years), and Pre-school (3 or 4 years onwards). Each with two strap options – regular and petite straps. The petite straps have simply 1.5 inches less padding to enable more petite parents to get the straps tight enough while back carrying. This review focuses on the standard (baby) size. For further info about the toddler size specifically see separate review. The Connecta is a very flexible carrier. It’s extremely simple – just 2 layers of fabric with some straps sewn on – but this means it can be worn in different ways: In different carrying positions and at different heights. All of which means it can fit a wide range of parents and personal preferences. And the lack of padding and bulk means it’s really lightweight and not at all hot to wear – great choice for summer. Also a great choice to use around the home as its so soft and comfy and you won’t overheat indoors. It also packs down really small! So it’s perfect to slip in your bag or under the buggy. Sturdy, secure and comfortable enough for a long walk, but soft enough to wear around the home. It fits a wide range of babies – generally speaking the Connecta works really well for babies from around 1 month of age through till about 2 years! Which is a huge range! This is because both the height and width of the carrier can be adjusted. The width can be adjusted with the accessory strap that comes with the carrier, and the height can be manually adjusted by altering the position of the waist band on the adult and then simply putting the baby in deeper or shallower with respect to the carrier. The intergrated hood can also help alter the height of the carrier and help support babies head – either by fastening as a hood for an older baby or by being rolled up into a neck cushion for a younger baby. Another reason this carrier lasts so well is the fact it offers 3 carrying postions – front, hip and back. Front is great while they are little, then when they enter nosy, want to see everything stage the hip comes into its own and the back carry is fab as they start to get older and heavier. It is worth noting that when front carrying the straps cross over the parents back. Many carriers offer both crossed and ruck sack style strap configurations but because there is no attached chest strap it is difficult to wear the Connecta in ruck sack style while front carrying. It’s possible when back carrying as the accessory strap can be then attached at the front to act as a chest strap, but this is very difficult to achieve while front carrying because of the difficulty in attaching something behind your body. This is not a really a criticism as I find many people find crossed straps more comfortable anyway, but it is worth being aware of as there are people who don’t find crossed straps comfortable and prefer ruck sack style. If you fall into the latter category but like the idea of the Connecta, then take a look at the Kahu which is a broadly similar carrier but does over rucksack straps. The other thing to be aware of is that the shoulder straps adjust in one direction only. This means that while they are very easy to tighten while back carrying, when front carrying you need to work against your wrist joint to tighten. There are ways around this (reaching across your back from behind or doing the “chicken dance”) and while most people don’t find this an issue at all, some people really do struggle to tighten and for them this is a total deal breaker. I’d say this is the case for about 1 in 20 – so definitely worth trying and seeing if this is OK for you or not. If it is a deal breaker, the Kahu Baby and Intergra baby carriers both have two way buckles and can be a good alternatives. All in all the Connecta is a very flexible, lightweight, simple carrier which will suit anyone looking for something they can use for a long time with their little one in different ways as suits their life! Cost is £80 and these can be purchased from Sheen Slings at sling library meets, consults and workshops (or please get in touch for a doorstep collection or even postage). As soon as you feel able! As soon as you feel able! I’ve known parents to carry right from the first day if they’ve felt well enough to do so. The important thing is to listen to your body – you’ve just given birth! So do take it easy on your body and give yourself time to heal but if you feel strong enough to give it a go. Go for it! Just ensure the baby is worn “high and tight” so there is no pressure on your recovering pelvic floor. What you are looking for is to have the baby high enough on your chest so that their ear is over your heart and/or the top of their head is close enough to kiss. And then tight enough that if you leant forward the baby wouldn’t draw away from you significantly. This tightness a) helps them feel more secure and prevents them slumping within the sling and b) it helps ensure the weight is evenly distrubted for you. When a sling is too loose, the baby feels heavier and this extra pull often manifests as pressure on your core and pelvic floor – both of which have just had a heavy workout during birth and we want to ensure aren’t carrying the load… so being confident in getting that tightness just right is key! 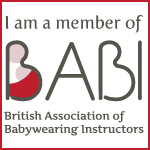 This is definitely something that if your not sure about it is well worth seeking out a babywearing consultant or a sling library drop in session and just checking because nailing that tightness makes an absolute world of difference. The exact same rules apply – as long as the carrier is high and tight and not putting any pressure on your scar or core there is no reason not to carry. It’s not like exercise you don’t have to wait for 6 or 12 weeks or any arbitarty point. It’s quite simply when you feel ready and while I’ve definitely known parents who’ve felt ready a week or so after a section, I’ve known others whose recovery has taken longer and its been more like 5 or 6 weeks. The one thing I would avoid is any carrier with a very heavy waist band at this point, but carriers such as the Caboo or stretchy wrap are absolutely perfect for those early days when you are still healing.